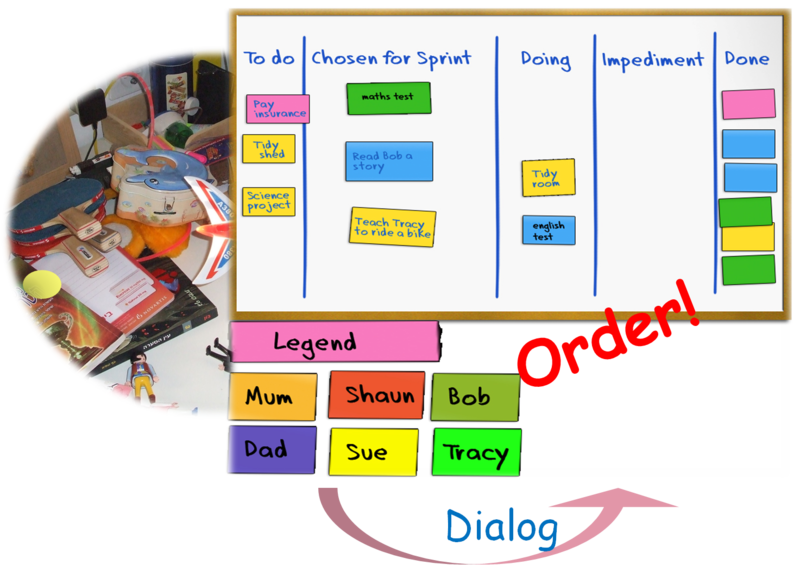 Your Family, Agile, and You: Using the task board to initiate the family dialog. Using the task board to initiate the family dialog. 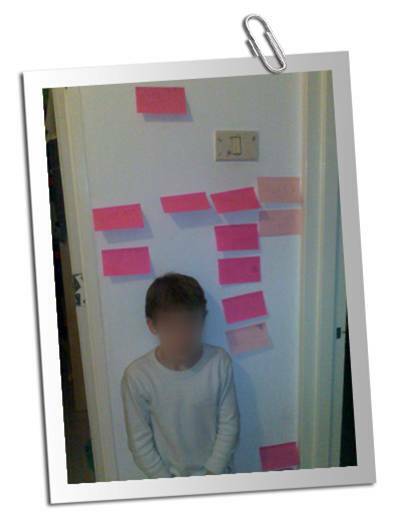 The Agile task board at home is not only about managing our daily tasks and chores as a family. It is also a good incentive for a family to start discussing those annoying tasks you never get around to doing, and more. 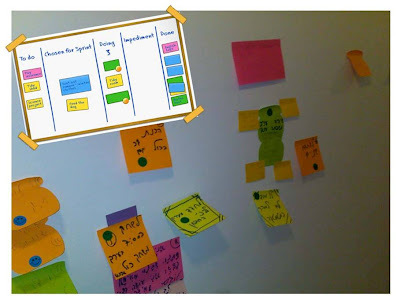 The task board is just a tool, a tool that sets the discussion context. After all, when we place our daily tasks on the board, we create visibility, when enables us to relate to each and every task. This creates balance. We don’t just relate to the problematic tasks that are stressing us out at that very instant, we relate to all of them. Before the task board, we only talked about tasks when we need to do them. For example, we need to brush our teeth NOW!, so that’s the only task we’ll talk and think about. The task board also enables us to see the tasks in general, not just those that aren’t good, not that aren’t being carried out, which tend to get more attention than other tasks. Our attention to those tasks that aren't carried out can also single out a single member of the family as the trouble maker, as the noise and attention to his tasks are greater than any others. You know what it’s like when one parent comes home after a long day, and immediately loses his or her temper over tasks that weren’t completed that day, making a whole scene that overshadow any discussion and don’t improve the general family mood at all. The task board enables you to set aside a specific time to talk about the tasks, and helps put in proportion those tasks that weren’t completed, and what impact the results really have on the family. The task board, as you know from work, enables us to see the successes, and give feedback where necessary. As the family starts getting used to the idea to talking about the daily tasks at a specific time during the day, and dealing with them one by one, you’ll find you have time. Time to talk to your children about things you REALLY want to talk to them about, like values, social matters, and so on, and all this without singling these discussions out as problematic even before we started talking to them. They just become part of the natural flow, and we treat them like any other task. After all, as time goes by, and we talk about tasks, they resolve themselves, and stop being so urgent, which leaves us room to talk about other things. Talking about the tasks has a magical effect on the kids, sometimes just due to the fact that we dedicated time to talk about what’s going on with them at home, listened and acted, especially when it comes in the shape of a large colourful board and a game, but most importantly, because we, the parents, set aside time just to talk to them. 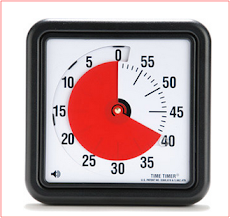 Even if it’s just 15 minutes, they are very efficient 15 minutes. After working for a few weeks, task boards start to take on different shapes and sizes. Sometimes you can even tell the family’s unique mood and dialog presentation by looking at them. They might vary from one family to another with the columns, number of tickets and issues detailed in them, but the important stuff stays the same. The communication over the daily tasks which facilitate a family dialog. 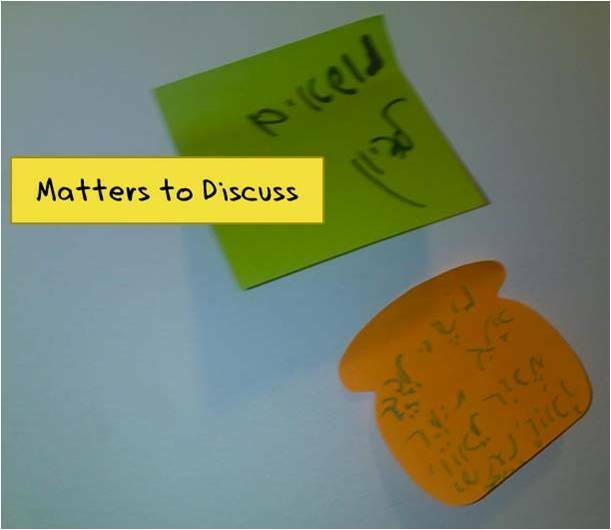 Note the "issues for discussion" notes, which is the first sign of a family managing to elevate the use of a simple task board into a real dialog between parents and kids. As the task board is actually a wall, the kids use notes to indicate column titles. They add new sticky notes in different shapes, with colorful Smilies showing who’s the task owner. Some tasks you can really see that the child has dedicated effort to writing down its content, which shows his understanding of the task, and has a good learning value. 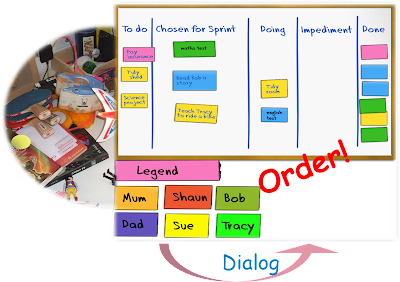 Although it singles out a specific family member and their needs, a child initiating his own task board is actually inviting us into a dialog.